Aaron Hernandez appeared in a Bristol County court yesterday, as his lawyers filed a motion requesting that one of his murder trials be moved "outside the boundaries of the Boston media market." Their reasoning includes a poll finding that most people in Bristol County already think he's guilty. Hernandez faces murder charges related to the June 2013 killing of Odin Lloyd near the then-Patriot's North Attleboro home. The change of venue request asks that the trial be moved farther west, to Worcester or Hampden counties. "The relentless avalanche of pretrial publicity — the likes of which have not been seen in this Commonwealth — has had a devastating effect on the jury pool in Bristol County," the lawyers wrote. The defense lawyers, in their motion, used strong words to describe the media coverage of Hernandez, saying it has been "poisonous, pervasive, and effective in tainting the pool of potential jurors." 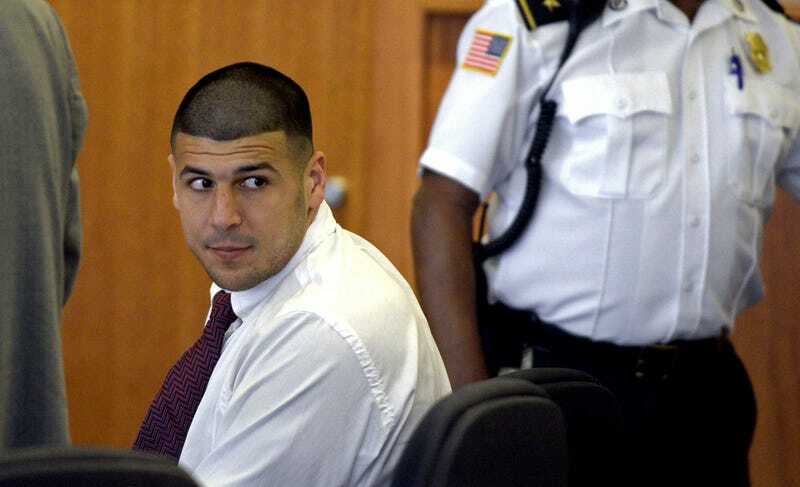 In the affidavit, Della Volpe said that 14 percent of the 409 adults surveyed agreed with the statement that, "I'm certain Aaron Hernandez is guilty of first-degree murder and nothing could persuade me otherwise." Fifty-nine percent agreed with the statement that "I'm not 100 percent sure, but I think Aaron Hernandez is probably guilty," Della Volpe said. Five percent said Hernandez was "probably not guilty." Citing the poll results, Hernandez's lawyers contended that the jury pool in Bristol County is "hopelessly biased." Prosecutors will respond to the motion at a later date, and their rebuttal will likely be some version of the argument that It's Aaron Hernandez. There's nobody who hasn't heard about it. Moving a county over isn't going to change that. Separately, Hernandez faces murder charges in Suffolk County for the July 2012 drive-by shootings of two men outside a Boston nightclub.